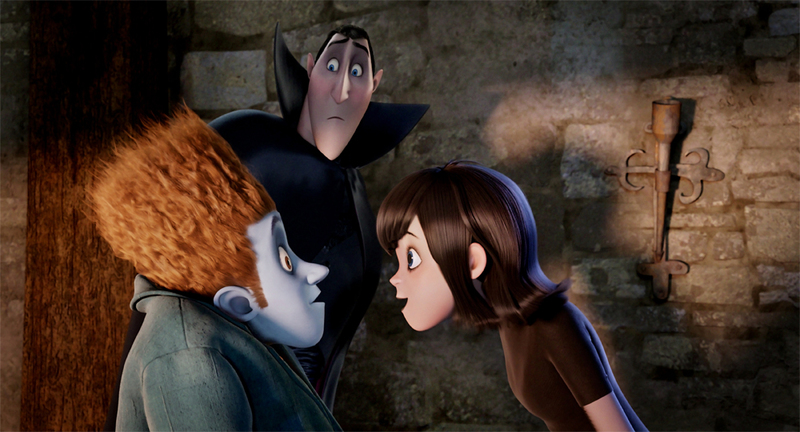 ‘Hotel Transylvania’ is a huge spectacle on the eyes. With giant colorful monsters, swooping camera pans at every scene, and a somewhat decent voice cast, you’d think ‘Hotel Transylvania’ would be the perfect movie for all ages this Halloween. 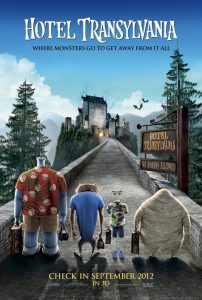 However, ‘Hotel Transylvania’ relies more on the visual aspect with keeping little kids entertained to the fullest every second, that the story and characters get left buried underground. With the other animated monster and zombie films that are out right now, this one ranks low on the list. 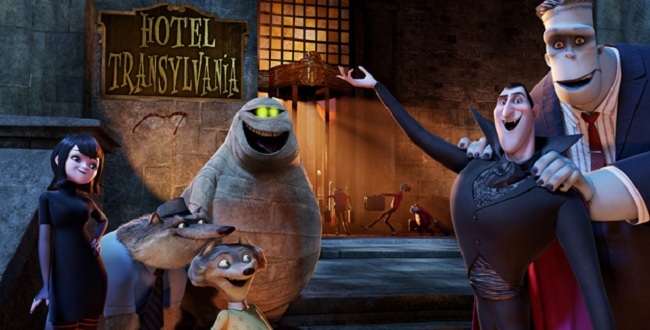 Genndy Tartakovsky directed ‘Hotel Transylvania’, which you might recognize that name. Tartakovsky is responsible for ‘Dexter’s Laboratory’ and ‘Samurai Jack’. Right off the bat, you know Tartakovsky has talent and has proven to have a cult following with older audience members and is hugely popular with young adults. You’d think that would have transferred over to ‘Hotel Transylvania’ , but unfortunately, that’s not the case. Robert Smigel, Peter Baynham, and Adam Sandler all put their hands in the script, and with their past several films, you can only imagine, how most of the jokes and plot fail miserably. From the start, all of the voices are over done and and over-the-top. I think they were going for the ‘louder and crazier is better’ approach. It was annoying and was not necessary. ‘Hotel Transylvania’ centers on Dracula (Adam Sandler), a father now who has opened a hotel for only monsters, for fear that humans, who once killed his wife 100’s of years ago with pitchforks and fire, are the same type of humans in present day, and that they will kill his daughter and his family and friends. His daughter Mavis (Selena Gomez), is turning 18 in human years, but 118 in vampire years, and her dad, Dracula does not want her to venture out in the world for fear of her safety. Mavis’s only dream has been to venture out in to the world and see everything other than her room in the hotel. And Dracula has gone to great lengths to persuade her to stay at home. In preparation for her big 118 birthday, Dracula has invited all of the monsters he knows for a weekend celebration in Mavis’s honor at the hotel including, Frankenstein (Kevin James) and Bride of Frankenstein (Fran Drescher), The Wolfman (Steve Buscemi) and the Wolfwoman (Molly Shannon), The Mummy (CeeLo Green), and few other monsters you might recognize. However, a 21 year old human man by the name of Jonathan (Andy Sandberg) wanders off from his back-packing the world crew, and accidentally wanders to Dracula’s hotel. Dracula notices the human right off the bat, and quickly disguises him as a monster, as his daughter takes a liking to the new monster. Dracula is constantly trying to keep Jonathan under wraps throughout the whole film, but slowly realizes that humans have changed over the years to decent and kind people. Dracula actually takes Jonathan under his wing. The whole film is nothing new to you. It’s safe, by the book, and dull, with the exception of how the film looks. 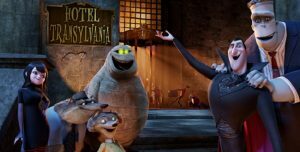 The visuals are pretty amazing in ‘Hotel Transylvania’. Everything is crisp, colorful, and giant. It feels like you are on a roller coaster at a theme park as you fly with Dracula through the hotel constantly. Sandler’s Dracula sounds a bit like his Opera Boy character from SNL, and I actually thought he was going to sing, but that never happened. However, he rapped. The rest of the voice cast is nothing to write home about besides maybe CeeLo Green’s mummy. It was lively to say the least. And just for good measure, the last scene of the film had to be a musical dance scene with CeeLo, Selena Gomez, Sandberg, and Sandler singing and rapping. It made me want to gouge out my eyeballs, and stick red hot fire pokers in both my ears. It was some of the worst sounds I ever heard. If you plan on seeing an animated kids film about monsters, stick with the other films that are out right now. Rent this one if you dare. Bryan Reviews ‘That’s My Boy’!!! This entry was posted on Saturday, September 29th, 2012 at 1:09 pm	and is filed under Film, News. You can follow any responses to this entry through the RSS 2.0 feed. You can skip to the end and leave a response. Pinging is currently not allowed. « Bryan’s Review of ‘Strike Back: Season 1’ Blu-Ray!! !